One Direction had more chart success in North America over the weekend, where their documentary This Is Us was the top draw at US and Canadian cinemas. But its opening tally of $17m (£10.9m) lagged some way behind the debuts that Miley Cyrus's and Justin Bieber's music documentaries had in 2008 and 2011. The British boy band's film also only just triumphed over last week's number one title, Lee Daniels' The Butler. 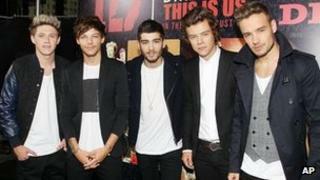 Morgan Spurlock's film shows the group in concert at London's O2 Arena. Hanna Montana/Miley Cyrus: Best of Both Worlds Concert still holds the record for 3D music documentaries, having opened five years ago with a $31.1m (£20m) tally. Justin Bieber: Never Say Never enjoyed similar success, launching in North America in February 2011 with a first weekend haul of $29.5m (£19m). US director Spurlock is best-known for his 2004 documentary Super Size Me, which was nominated for an Academy Award the following year. His latest "motion picture event", which opened in the UK and Ireland on Thursday, combines fly-on-the-wall footage with 3D sequences that show the UK quintet performing. Lee Daniels' The Butler, about an African-American manservant working at the White House, has topped the North America box office chart for the last two weeks. Starring Forest Whitaker and US talk show queen Oprah Winfrey, the film earned $14.7m (£9.4m) in its third weekend in US and Canadian cinemas. Risque comedy We're the Millers, starring Jennifer Aniston, claimed third place in this week's chart, while Disney's animated Cars spin-off Planes is ranked at four. Instructions Not Included, a comedy vehicle for the Mexican TV star Eugenio Derbez, made history at five by achieving the biggest ever opening for a Spanish-language film in North America.